Recording preferred pharmacy is a feature that captures a patient's preferred pharmacy that creates efficiency within the prescription ordering flow for providers who struggle with selecting pharmacies to send prescriptions to. I was the lead designer on this project and my role was to provide a holistic design solution that streamlines the prescription ordering workflow. Through the adoption of Electronic Health Records and paperless workflows, providers have been burdened with more administrative tasks. In an effort to alleviate administrative workload, this highly requested feature would create more efficiency in the prescription ordering workflow. After combing through user forum requests, the product team determined preferred pharmacy a quick win for users and low effort to achieve for development. Feedback helped us determine requirements and nice to haves. Product decided to split this project into a two sprints. Initial release would include providing an area in the patient profile to capture preferred pharmacy. In the second sprint, our goal was to complete the loop by presenting saved preferred pharmacy within the ordering flow as well as the ability to save a new preferred pharmacy during the prescription ordering flow. The patient profile houses important non-clinical information about the patient. Within the Prescription section of the profile, a preferred pharmacy can be added to the patient's profile. 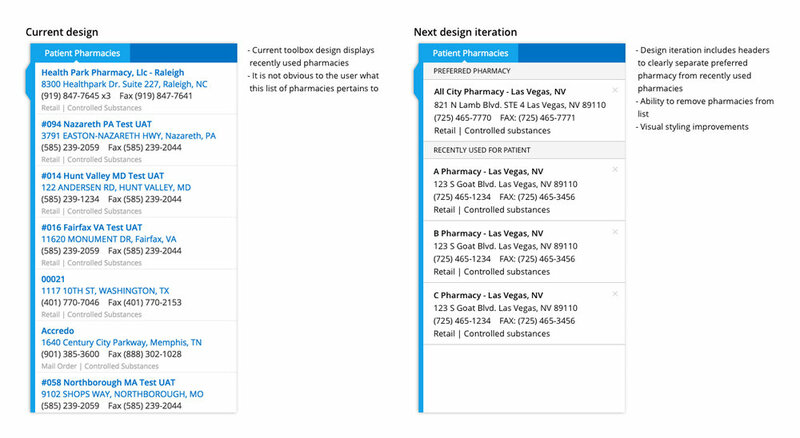 To reduce development effort, we reused the same detail pane used for the prescription ordering flow to search and select a preferred pharmacy. Providers are able to remove and select a pharmacy. Because this project was split into 2 sprints with the 2nd sprint heavily descoped, we were releasing a half useful feature which is a degraded experience for users. Design had to negotiate for the bare minimum to make this feature usable by proposing to autofill saved preferred pharmacy in the prescription ordering flow. Although not an ideal execution and design, I provided the team with the next design iteration once our product roadmap opens up for rework. My proposed visual improvements organized and provides more clarity around the list of pharmacies. "I am so happy that we now have the preferred pharmacy available! Before this, when I had to call in a controlled substance I had to pretend to reorder another drug up to the point where I finally got to the window with the pharmacy info. Or I would cut and paste the pharmacy into the patient’s profile. This makes life so much easier. Thanks so much for making this change." "I think it would be much more useful to be able to edit the list of previous pharmacies for a particular patient. Oftentimes patients end up with five or six pharmacies due to insurance changes or patient preference. Culling that list would be very useful." As this user points out, the prescription ordering flow could use improvements beyond displaying a patient's preferred pharmacy. When working on the prescription flow, I proposed a design that would allow more flexibility in the patient's pharmacy list (i.e. deleting, saving as preferred, etc.). We hope to redesign and improve the prescription ordering flow sometime in the future to better integrate with the preferred pharmacy feature. With limited technical resources and descoped requirements for release, I was able to negotiate for the minimum viable product to make this feature useful for our users. Although we were unable to release with proposed designs and functionality due to limited resources and time, when the opportunity to improve the prescribing flow rises, our team is prepared with designs and user research to validate these decisions.